Below is a picture of a cluster of 4 Red Pitayas synchronized via the SATA connectors. A 10 MHz clock is also output on the SATA OUT connector. The 4 Red Pitaya are connected to each other using 4 SATA cables in a ring configuration. The cluster clock is provided by a waveform generator on the DIO1P pin of the 3rd Red Pitaya (from top). 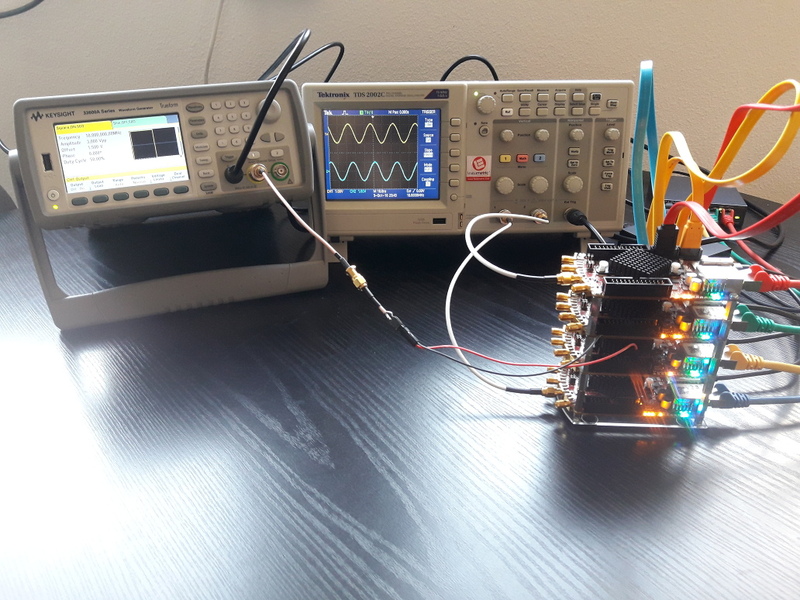 Each Red Pitaya outputs a 40 MHz sine signal from a DDS block that can be monitored on a scope trigged with the SYNC output of the function generator. The 4 sines have exactly the same frequency but their relative phase is somewhat random. One could use the differential pair left on each SATA connector to transmit some trigger between the Red Pitayas. Is the FPGA code of your project publically available for reference? That could be a helpful example for a project I'm currently working on.